Where: Baku, Gobustan, Absheron. Azerbaijan, Asia. What: Flame Towers, Aliyev Design Centre, Carpet Museum, Nodding oil derricks, Mud Volcanoes, Flame Mountain (Yanar Dag), Fire Temple, Baku TV Tower, Baku Old City, Petroglyphs. How: International flights, Walking, Taxi, Lada, Baku Metro. Illnesses or mishaps: Getting a touch of 'Baku belly' and being completely unable to source a decent flat white coffee anywhere - I know, it's a first world problem. Azerbaijan was the second country on my journey east from the United Kingdom to Australia, first stopping in Belarus, then Azerbaijan and finally China. 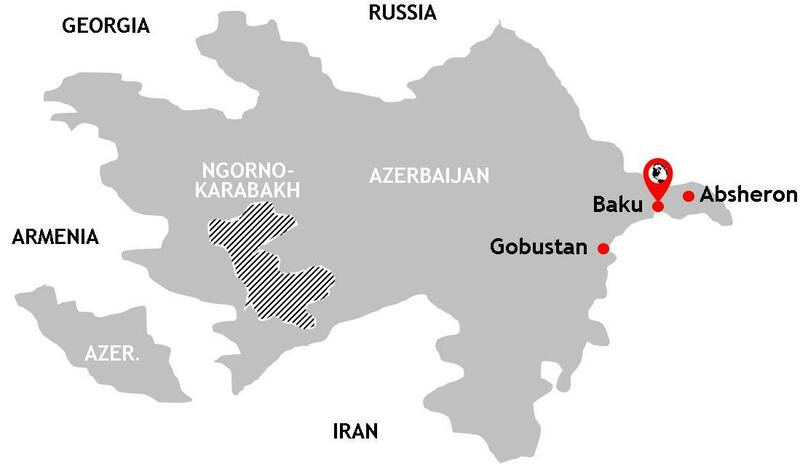 Azerbaijan is one of three countries making up the Caucasus region, one which straddles the extremities of Eastern Europe and Western Asia and one sandwiched between the powerful forces of Turkey to the west, Russia to the north and Iran to the south. This goes some way to explaining fractious relationship the Caucasus trio have with each other; it is a region bedevilled with tension and appears to be one which is uniquely predisposed to fragmentation, with regions and scraps of land breaking away from each other and declaring their independence - triggering wars and stoking tensions further. Indeed, my Chronicle map above gives a flavour of this complexity, showing Azerbaijan with both a break away patch of land to the west (landlocked by Armenia) and a contested region within its own borders (Ngorno-Karabakh). Technically Armenia and Azerbaijan remain at war and, therefore, the border between both is closed. Indeed, the British Foreign and Commonwealth Office advises travellers to avoid all but essential travel to these areas, often playing host, as they do, to regular outbreaks of violence between Armenian and Azeri forces. However, providing you steer clear from its trouble spots, the 'frozen' nature of the tensions in this region mean it is relatively safe for travellers. I came tantalisingly close to Azerbaijan back in 2012 when travelling around the two other countries which make up the fractious Caucasus region: Georgia and Armenia. Back then gaining an Azeri visa was a labyrinthine process which also required the component most dreaded by travellers eager to see the world's more unusual and off-the-beaten-track places: the LoI or Letter of Invitation. However, in January 2017 all of that changed and rules were relaxed, allowing travellers to secure, for a nominal fee, an online e-visa in three simple steps through Azerbaijan's new ASAN Visa system. Our visas arrived by email a few days later. Five years after last visiting the region, Azerbaijan became my 78th country. Baku in January is bitterly cold: wearing two hats, two coats (on top of a tee shirt and jumper) and a pair of long johns under my trousers managed to stave off the cold just long enough for short bursts of sightseeing during the day. Winter also meant that, apart from a few Russians (who visit places like Azerbaijan because they are deemed 'friendly' countries by the Russian Federation) we appeared to be the only tourists in the city. It certainly felt like this anyway. Our Russian-style fur hats drew the attention of locals who sniggered at our attempts to keep the sub-zero Azeri winter out. The Azeri capital hugs the curved shoreline of the Caspian Sea. It's a city on development steroids as the Azeri government builds itself a capital city of international renown in a petroleum-funded frenzy. The Baku skyline is dotted with fantastical and creative buildings set amongst carefully maintained gardens and other visual offerings designed with the tourist in mind: a large Azerbaijan flag; a miniature version of Venice where you can take a ride on a plastic Gondola; a giant chess board; a carpet museum in the shape of...a carpet. Whilst impressive it does, at best, feel contrived and at worst a little Disneyfied. But Baku's most recognisable landmark is indisputably the Flame Towers, three fire-shaped skyscrapers which come to life at night with computer choreographed lights in the shape of fire and fluttering Azerbaijan flags. These were the towers which featured so prominently during Azerbaijan's hosting of the Eurovision Song Contest in 2012 an event which, for many, put the country on the map for the first time. What you initially perceive as an unusual and interesting light show comes dangerously close to the kitsch and tasteless when an animation of silhouetted men waving the national flag appear. However, on closer inspection it is clear that, even years after they were built, the Flame Towers are predominantly empty and that this fantastical light display is, in fact, projected from buildings which, commercially at least, are struggling to attract tenants. And this underscores another aspect to Baku: things aren't always what they appear in this glitzy Caspian city - much of which seems to be concerned with outward appearances. Baku is dressed to impress. The fact is that Baku is a postmodern, Magpie-like city which has appropriated and borrowed icons from around the world in a bid to decorate its nest. It is a heady assortment of things from elsewhere: the aforementioned Venetian gondolas, red telephone boxes from London housing banking machines and traditional Hackney carriage-style taxicabs, also from London but with a chequer tape running down their side (taken from the New York taxi? ), decorative street kiosks which look positively Parisian and a new building along the shoreline which looks suspiciously like the Sydney Opera House. In fact, depending on where you look in Baku you could be in Egypt, Turkey, France, Iran, Russia or a Gulf state like the UAE. It is often travel writing hyperbole to claim that a particular country is a cultural crossroads or a melting pot of influences. It's a phrase that is bandied about all too readily but, in the case of Azerbaijan, it is more true than any other place I have been. It is a destination that defies simple categorisation and for this reason alone Baku, and Azerbaijan more generally, will keep you guessing until the very end. Sometimes in travel it's nice to go somewhere where you have no idea what to expect. 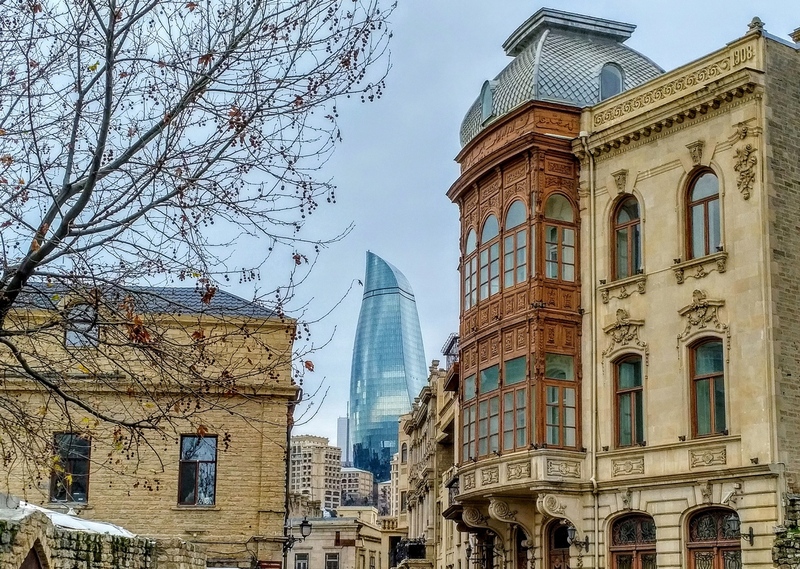 Away from all the glass modernity lies Baku's Old City, a UNESCO listed labyrinthine warren of streets with romantic overhanging balconies, cobbled paths, modest mosques and little souvenir shops. Some shopkeepers have clearly taken great care in staging their wares, making them a particularly wonderful photographic opportunity for travellers like me; they are exquisite little works of art in their own right. Indeed, the range of items for sale lays bare, perhaps more clearly and succinctly than anywhere else, the diverse cultural and political influences which all converge on Azerbaijan: Turkish rugs, 'Telpak' hats worn by men in Turkmenistan (which is on the other side of the Caspian Sea), Soviet badges and busts of Lenin, and trinkets with Persian designs. In sharp contrast to the Old City, and at the far end of Baku Bay, is the communist-designed Television Tower. Perched high up on a hill its crude concrete mass now overlooks a very modern and aspirational Baku. Aside from a single hammer and sickle motif I espied on one of Baku's older buildings, the tower seems to be one of the few reminders of Azerbaijan's Soviet past, so dramatic has the city's transformation been in recent years. No trip to a country of the former Soviet Union would be complete without a journey to the top of a concrete cosmic relic such as this. Soviet television towers were a by-product of the Space Race with the West; such constructions a physical representation of communism's technological prowess. They are completely absurd, ugly and, I believe, rather wonderful things, acting like a touchstone to a bygone mindset which, possibly with the exception of a visit to Belarus, you can now only read about in history books rather than experience first hand. Like so many I have experienced before (see my World Towers page), the tower's restaurant floor revolves slowly, allowing you to enjoy your coffee and see the city in full 360° without having to leave the comfort of your seat, the occasional mechanical sounds and indelicate lurches forward completing this most Soviet of dining experiences. Whilst the Azeri TV Tower alludes to the past, the Heydar Aliyev Centre, named after Azerbaijan's former president (along with the international airport), points firmly to the country's future and is a symbol of Baku's newly chosen direction of travel. Designed by Iraqi-British architect Zaha Hadid, its white liquid-like shapes and rounded curves aim to show Baku as a confident, stylish and sophisticated city with international aspirations. A building of such architectural complexity and minimalist style is a statement piece you might more readily associate with a city such as Dubai. But it's in Baku, the capital city of a country most people have never heard of and, if they have, it's probably only because of Eurovision. So, is it Paris, London, New York and...Baku? Not quite. Well, not yet anyway. But give Baku time. 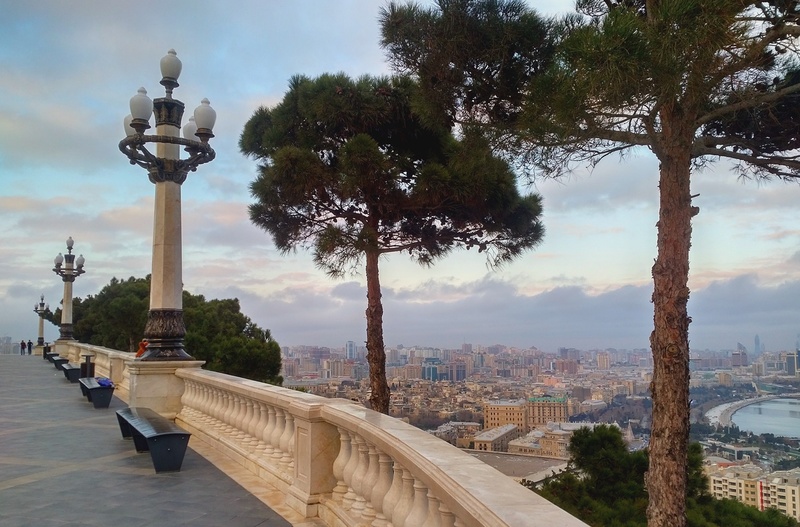 Whilst Baku's ambitions are honourable, the tourist experience as far as I was concerned was far from what you might expect from a great international city: bad coffee (everywhere), even worse hotels and over-priced food. Infrastructure was also problematic; to experience one of Azerbaijan's greatest sights, the Mud Volcanoes, we had to scale up a slippery mountainside in a Lada driven by a friend of a taxi driver (more of that in my Gobustan section below). I digress. Like many Gulf States, to which Azerbaijan has more than one parallel, Baku markets itself as the latest culinary destination but, having eaten there for the best part of a week, I'd say it has a fair way to go in order to realise such lofty ambitions. But that's okay. I didn't go to Azerbaijan for any of this: I went solely to see and experience a place many will only ever hear of, if indeed they hear of it at all. I like my countries to be off the beaten track, unusual and interesting. And Azerbaijan is all of these things. 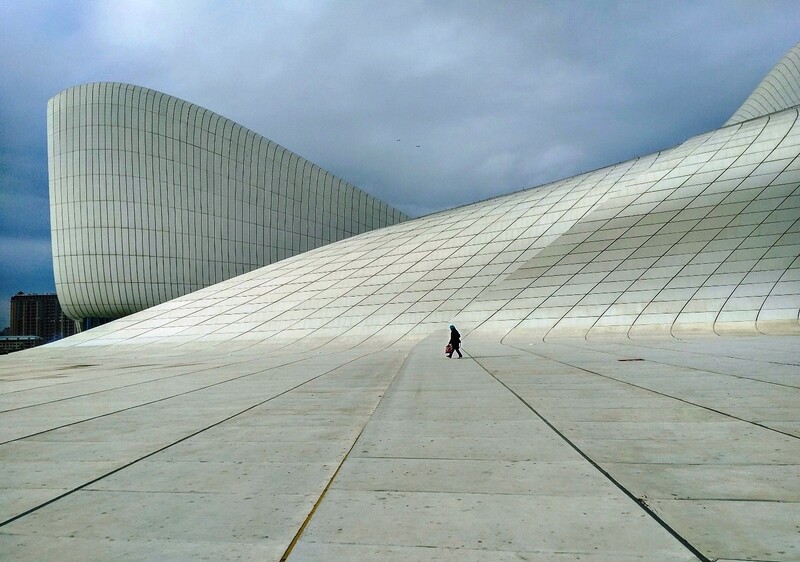 Azerbaijan was also a chance to experience another place yet to be warped by mass tourism. I liked the fact that we received quizzical looks from locals; the fact that everything wasn't easy; the fact that our tour guide for a day was someone's dad who didn't speak a word of English; the fact that we had to take that crazy journey up a mountainside in a Lada. That's travel. 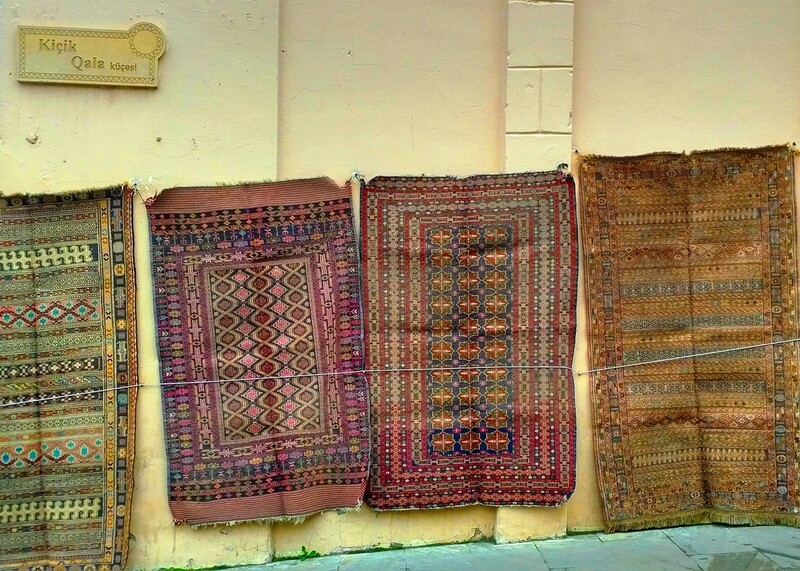 Azerbaijan, therefore, is a chance to experience something increasingly rare in travel: authenticity. Indeed, Azerbaijan has so few international visitors (comparatively speaking) that following my visit a government department sent me an electronic questionnaire asking for feedback on my experience in their country! What a nice touch, one that served to endear me to Azerbaijan even further. Baku knows how to target tourists: large 3D letters say "Hello Baku". Sorry, I couldn't resist - I'm a tourist at heart. One of the three Flame Towers peaks between the rambling streets of Baku's Old City district. 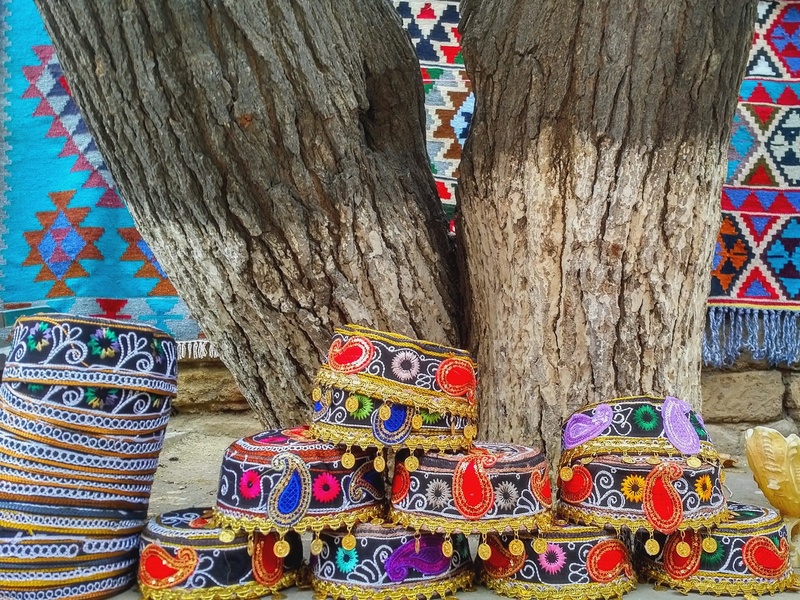 Cultural hats for sale in Baku's Old City. Shopkeepers create particularly exquisite displays here. 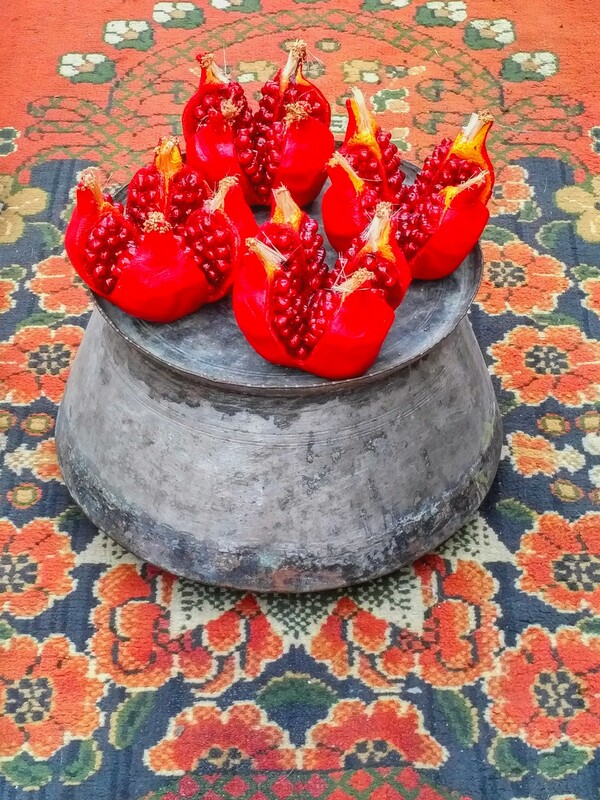 Pomegranates upstage a Turkish rug. The Heydar Aliyev Centre aims to show Baku as a confident, stylish and sophisticated city with international aspirations. 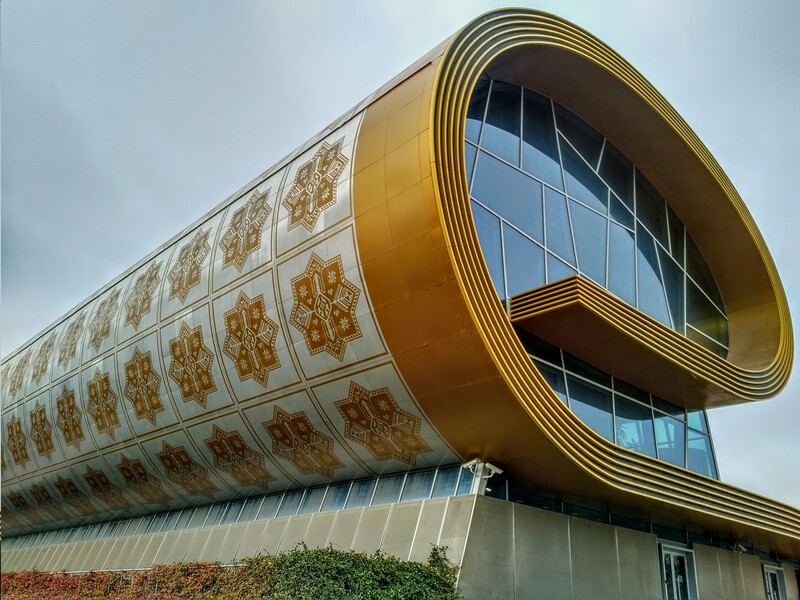 Baku's Carpet Museum along the shore of the Caspian Sea imitates the shape of a rolled carpet and features an Azeri pattern. The grand entrance to Baku's underground Metro system. Evocative view of Baku at dusk. 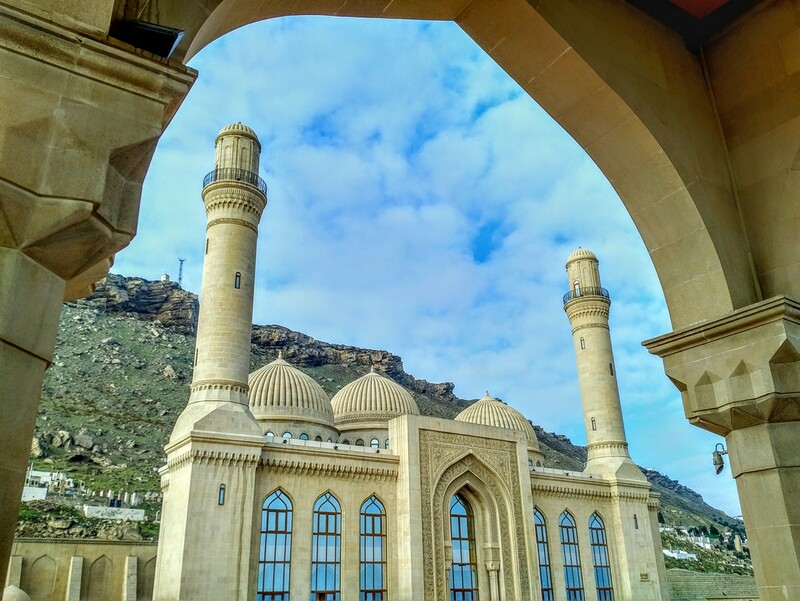 The Bibi Heybat Mosque, on the outskirts of Baku, seen here framed by a nearby Islamic arch. 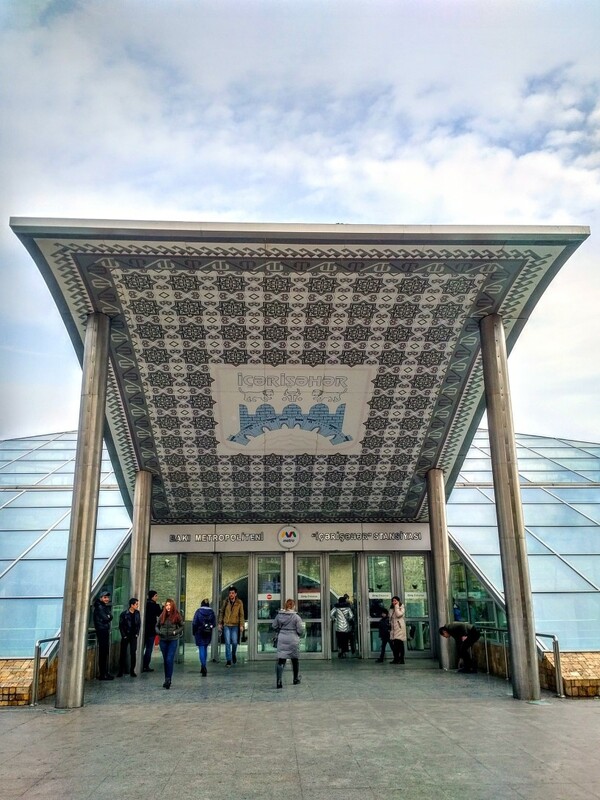 The amount of time we had in Baku was dictated by the limited number of scheduled departures to China on the national carrier Azerbaijan Airlines. 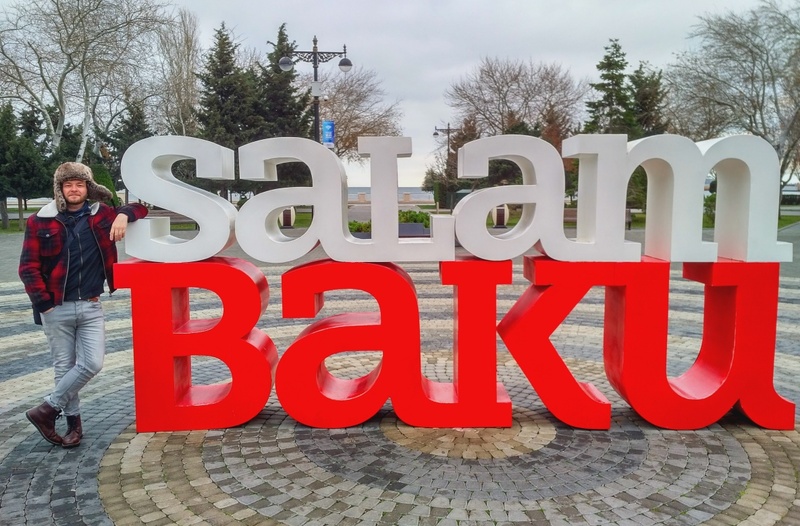 Whilst initially a little frustrating, this was a blessing in disguise because it allowed what was to be a mere city break to extend beyond the glitzy, sequin-covered capital of Baku - and, as we were to find, Azerbaijan has some incredible sights which are within easy reach of the city. 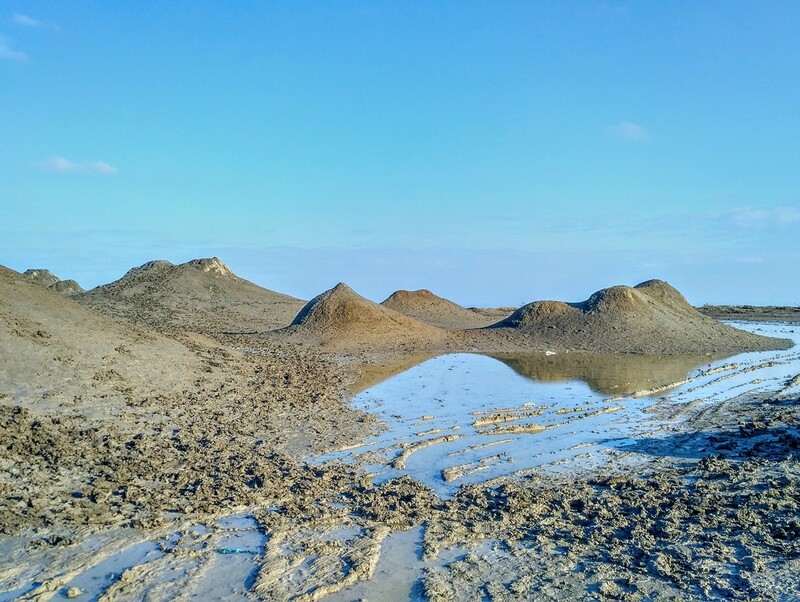 Our hotel's (only) driver was reluctant to drive us out to the fantastically weird cluster of Mud Volcanoes at Gobustan, claiming the ground had been made impassable by recent wet weather. But, in travel, if at first you don't succeed, keep trying. After all, we were only going to be in Azerbaijan once. So we did what every traveller does when their cheapo hotel lets them down: we headed to the nearest five star hotel for advice. We fell upon the services of a kindly concierge who was happy to translate our wishes to a waiting taxi driver. For a bargain price of 20 Manats per hour (about £10), he would drive us out to Gobustan. We weren't to know it at the time but our trip southward to Gobustan was to make our visit to Azerbaijan a truly unforgettable one. 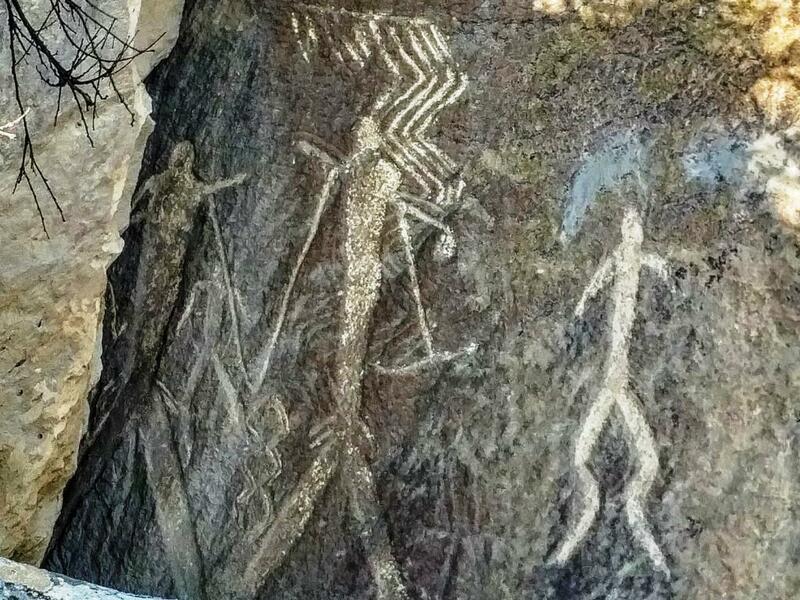 Stop one was the Gobustan Petroglyph Reserve, a part of the boulder-tastic national park wherein which engravings of frog-like human figures and reed boats made by hunter gatherers date back 12,000 years to the Stone Age. Impressive. But the best was yet to come. Setting off further south from the Petroglyphs our taxi driver, driving one of Baku's boxy Hackney carriage taxis, pulled over at the side of the motorway where we swapped vehicles. We were handed over to a giant of a man whose tiny white Lada was to be our chariot along the dangerous quagmire of a mud track and up the mountainside to the volcanoes themselves. Driver Number One also joined us in the Lada, sitting in the passenger seat whilst we squeezed in the back. We had previously been told that a 4WD was the only vehicle capable of tackling the treacherous route. So why were we sat in a Lada? Answer: because locals know that only a Lada is small, light and nimble enough to make it through the mud and up the slippery mountain. The laws of gravity dictate that the heavier the vehicle, the quicker they'll sink. Indeed, some unfortunate souls we passed along the route had done just that, including a group of Russians who were forced to abandon their car and instead head up the mountainside on foot (one man choosing to walk barefoot rather than ruin a perfectly decent pair of shoes). Our Gentle Giant Lada driver was superb at handling the car, thrusting its wheel left, right, left again to avoid getting bogged down in the mud. The car skidded and bounced and, at a number of points, I thought that perhaps we should have heeded the warnings voiced back in Baku; I had visions of having to get out of the car to help dig it out. But he knew what he was doing and any fears I had about being in a car I'd initially deemed completely inappropriate soon evaporated. Expert driving, combined with the trusty machinery of a Soviet-era tin can on wheels, meant that after a few touch-and-go moments we had made it along the makeshift track and onto the mountain plateau, home to one of the strangest sights I have ever clapped eyes on: a collection of conical shapes, some metres high, bubbling and coughing their thick grey liquid and shooting the odd flame up into the air. The volcanoes were all rather astonishing in themselves but set amid an eerie lunar landscape, encircled by a 360° mountain range, and topped with a deep blue sky, was truly remarkable. I was hopelessly ill-prepared for the challenges this fantastically muddy landscape posed: the thick mud sucked and pulled on my trainers at every step. I tightened the laces as much as I could, preventing them from being completely left behind in the deep, inevitable squelch of my next step. It didn't matter that my trainers were ruined - the Mud Volcanoes were truly worth the sacrifice. Bizarrely, Driver Number One, the most ill-equipped of us all, joined us among the bubbling volcanoes wearing his formal black leather shoes, seemingly having been overcome with as much excitement as our own, leaving the dignified safety of where the car was parked and taking to scrambling over the mud cones along with the rest of us. 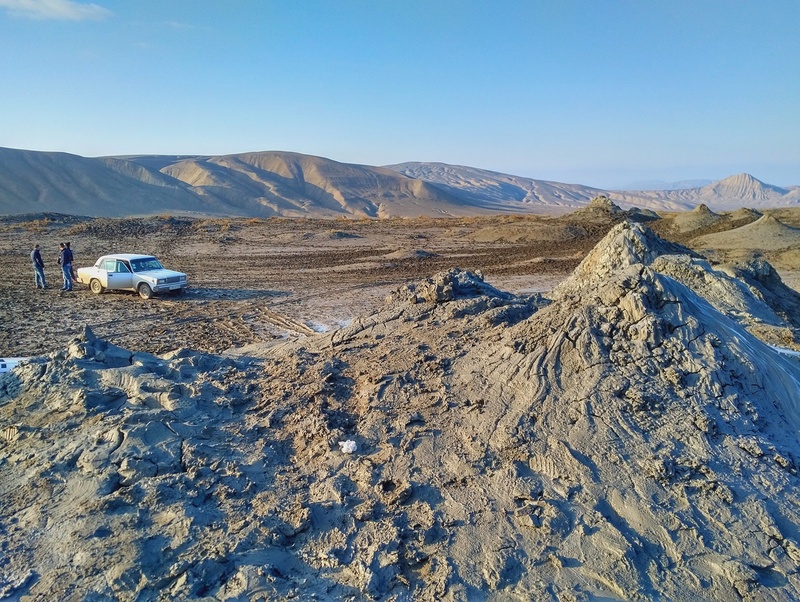 Standing on top of a gurgling mud volcano I surveyed this most Science Fiction of landscapes, one which was, rather incongruously, disrupted by the presence of three white Ladas parked in the mud below and positioned at disconcerting angles. We were a million light years away from Baku. And it was great. The journey back down the mountain and along the mud track was equally as touch and go as the journey up. Other drivers, with eager tourists in tow, slowed down to ask us if the route was passable. In their bulky cars I didn't fancy their chances. I translated for a French couple who understood English but not Azerbaijani. Who knows if they made it or not. On arrival back at the main road I tried to tip the Gentle Giant who had been so kind, whose little white car was now anything but white, splattered, as it was, with mud and who had personally got down at my feet and helped scoop mud from my ruined trainers with a carrier bag he had fetched from his boot - only for his tip to be intercepted by Driver Number One's nimble finger work. I was devastated when I realised what had happened. Our Gentle Giant had driven awesomely, given his car some serious wear and tear (the smell of burning wafted past my nose on at least two occasions) during the two hour expedition and he now had a major clean-up job on his hands - and all for 5 Manats (£2.50). Sometimes in travel you see, experience and are even unwittingly part of things you do not like or agree with. They act as powerful reminders of just how lucky some of us are. The Gentle Giant vanished into the distance seemingly happy with his level of remuneration and I, a little humbled by the experience, headed back in the direction of the Azerbaijan show capital - a capital of which he was clearly not a part. The following day we headed out to the Abseron Peninsula to tick off two remaining sights: the Atesgah Mebedi, or Flame Temple, and the remarkable Yanar Dag, or Fire Mountain. Yanar Dag is a mountainside which, because of its location above natural gas deposits, has been shooting flames ever since a shepherd discarded a cigarette there back in the 1950s. For the second time in twenty four hours, Azerbaijan had surprised and stunned me with something straight out of Science Fiction. And the entrance fee for beholding such a unique sight? Two Manats (around £1). Our journey back from Yanar Dag was punctuated by the nodding donkey heads of oil derricks; whilst understated and sculptural individually, when clustered together in their hundreds, they cut an awesome, melancholy sight. 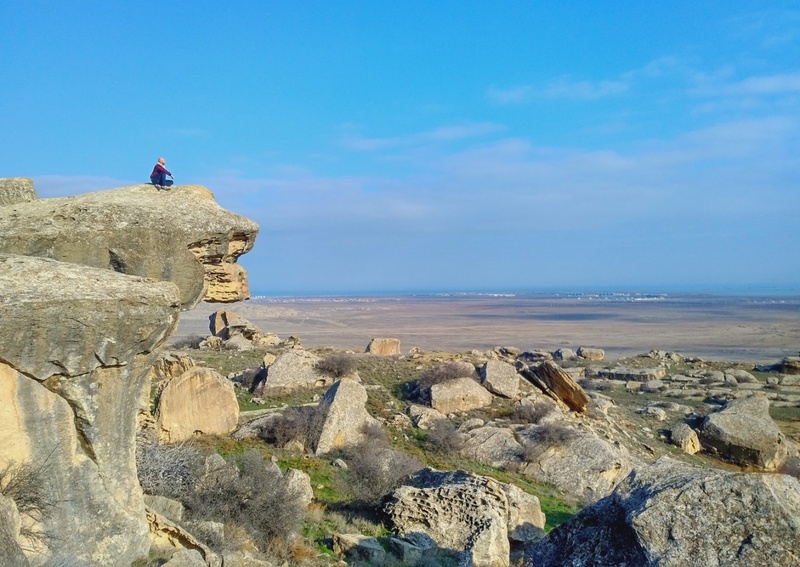 Overlooking a flat Gobustan landscape from the boulder-tastic National Park, part of the Greater Caucasus Mountain Range. 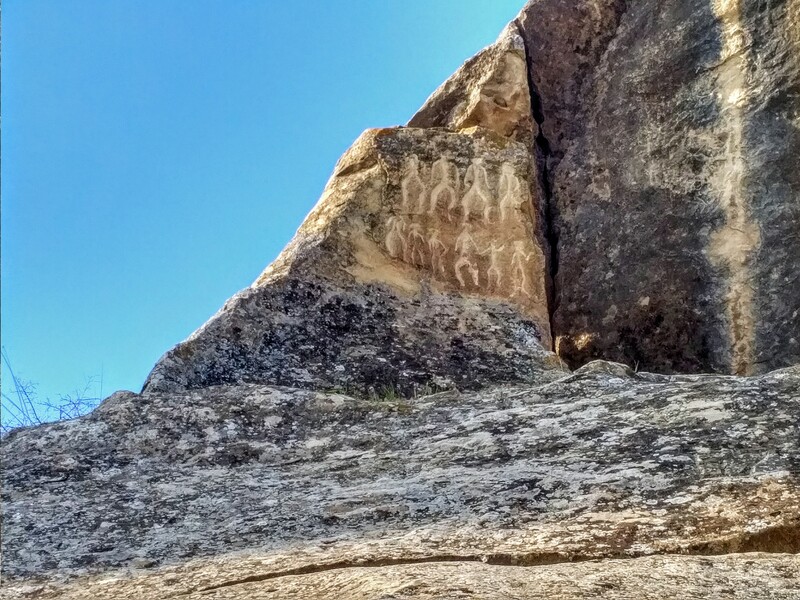 Petroglyph carvings dated 10,000 BC. 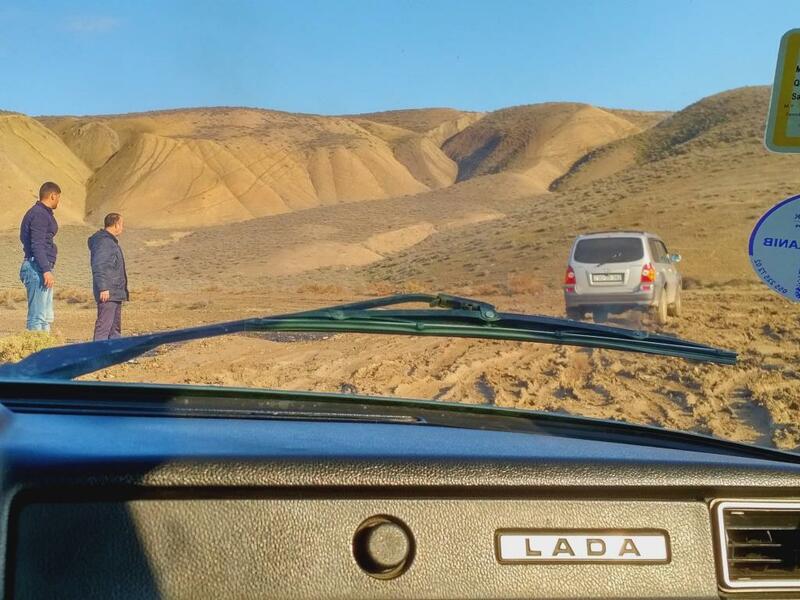 Memorable adventures in a Lada: the Gentle Giant and Driver Number One get out of the Lada to assist another motorist who is stuck fast in the mud. 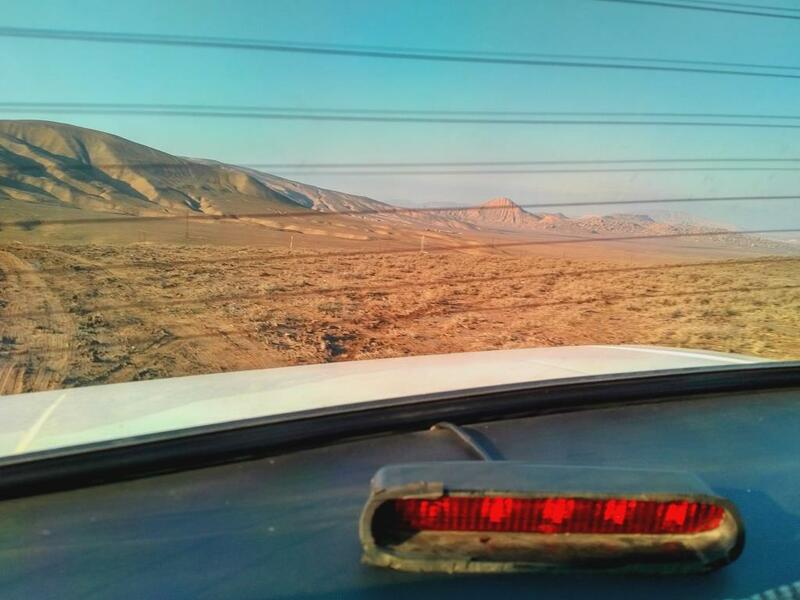 The striking view out of our Lada's rear window - that's adventure travel! Somehow our Lada has taken us to the moon. Lunar landscape : a climb to the top of a mud mound afforded me an incredible view across the mountain range. I wasn't expecting this. Lunar landscape : mud bubbles to the top of a mud volcano amid a landscape straight out of central casting for a Science Fiction film. Lunar landscape : a blue Azeri winter sky reflects in the trapped waters of the volcano-scape. 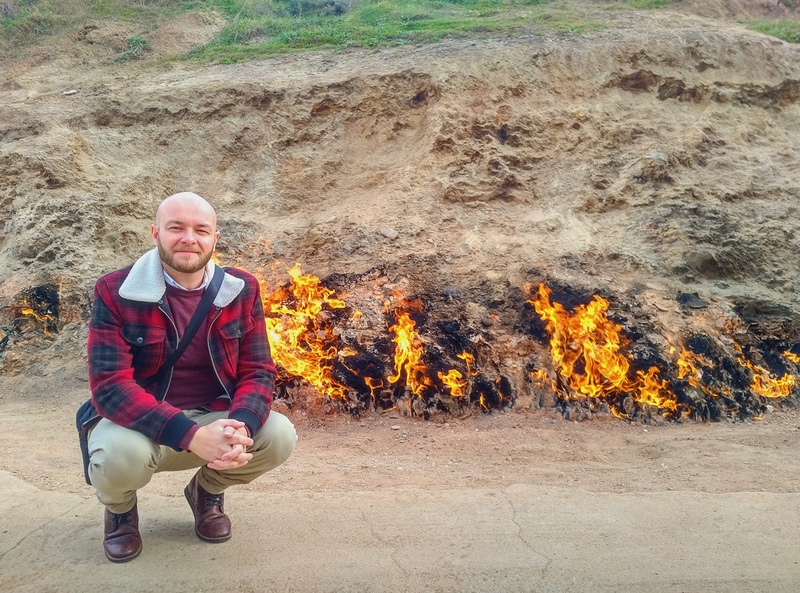 In Azerbaijan even the ground is on fire! Abseron's Yanar Dag (Fire Mountain) is the result of natural gas and a shepherd who threw a lit cigarette on the ground back in the 1950s. This mountainside has been burning ever since. The heat was intense and the smell overpowering. Consider your route carefully if you are wanting to travel to all three countries. Georgia is the transit country for both Azerbaijan and Armenia because, technically, both of these countries are at war. Rumour has it that you can get into Armenia with an Azeri stamp, but not the other way round. Plan out the order of your trip carefully. Ensure you keep the printed pdf of your 'e-visa'. Even though it's electronic I was asked for my hard copy both on entry and exit to the country. Keep it somewhere safe to avoid a sticky situation on departure. 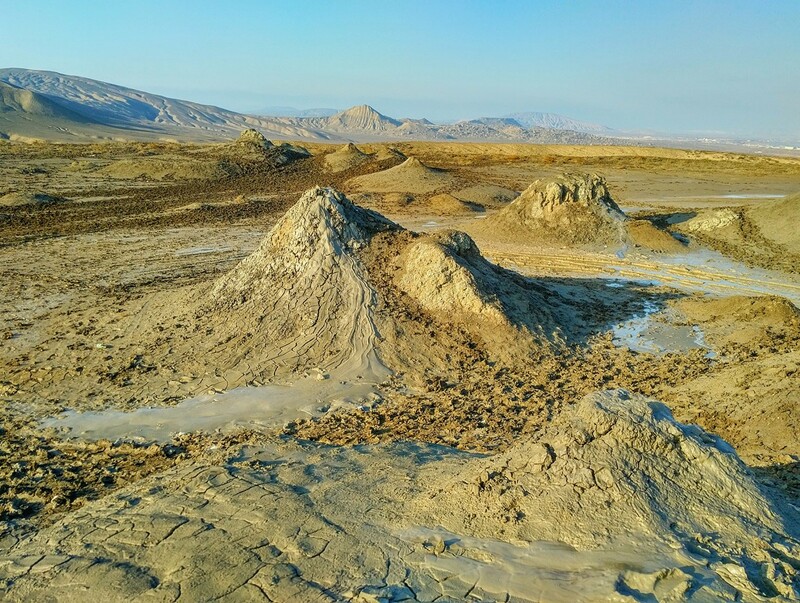 Your ability to see the Mud Volcanoes at Gobustan will ultimately be decided by the weather. Rain in the area quickly makes the mud track completely impassable.